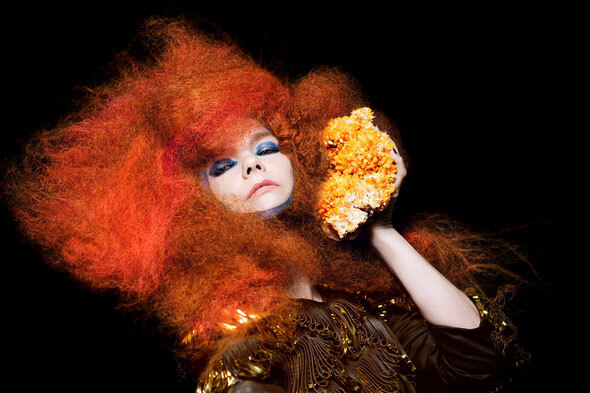 Björk has collaborated with biomedical animator Drew Berry to create a partly-scientific representation of the haunting song, ‘Hollow’ from the Biophilia project. Of the video Björk says: "It's just the feeling when you start thinking about your ancestors and DNA that the grounds open below you and you can feel your mother and her mother, and her mother, and her mother, and her mother 30,000 years back. So suddenly you're this kinda tunnel, or trunk of DNA... all these ghosts come up so it ended up begin a Halloween song and quite gothic in a way... It's like being part of this everlasting necklace when you're just a bead on a chain and you sort of want to belong and be a part of it and it's just like a miracle." On blending his scientific work with Björk’s, music director Drew comments: "The ‘Hollow’ music video is a powers-of-10 exploration of the microscopic and molecular landscapes inside Björk's body. The animation was constructed from molecular models of DNA and proteins derived from various forms of scientific data such as x-ray crystallography. “The inspiration for the face came from the 'fruit face' paintings by the 16th century Italian artist Giuseppe Arcimboldo who took objects such as fruits, vegetables, or books, and arranged them in such a way that they formed a portrait."